....1934 was a productive year for artist Ray Strong. The native Oregonian, just settled in the San Francisco Bay area the year before, completed 2 large easel paintings of San Francisco from Russian Hill and his large painting "Golden Gate Bridge under Construction" had been selected to hang at the Corcoran Art Gallery in Washington D.C. All three had been created under the auspices of the New Deal art program known as the Public Works of Art Project (PWAP.) 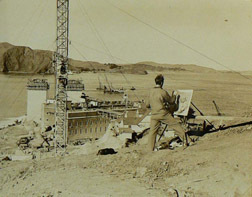 He was working on another PWAP assignment, a 5 by 25 foot landscape mural of the Skyline hills of Santa Clara Valley for the library of Theodore Roosevelt Junior High School in San Jose, when he received word that his "Golden Gate" picture had been selected by President and Mrs. Roosevelt to hang in the White House. These were all significant achievements for the 29 year old artist. ....Upon completion of the school's library mural, the students approached Ray with the idea of creating yet another mural for their school, to be paid for with funds from a school paper drive with the plan to match the $37.50 per week he received from the PWAP. The students gave Ray carte blanche to develop the design. At that particular time in Ray's career as an artist, he was actively engaged in promoting the Cooperative Movement, starting the San Francisco Art Students League, art gallery, and art supply store based on cooperative ideals. He was studying art at the Art Students League in New York at the onset of the Great Depression and his firsthand experiences and observations of its effects spurred his interest in alternative social and economic theories, including the Cooperative Movement. Also, like many Americans during the mid 1930s, he was becoming increasingly alarmed by political unrest in Europe, particularly the situation in Spain which would soon erupt into the Spanish Civil War. He decided to create a design which would graphically depict the harsh consequences of war on one hand versus the benefits of peace and cooperation on the other. ....When Ray presented his preliminary sketch to the school administrators and teachers, he encountered opposition predominantly because of the graphic war imagery it portrayed. The field of skulls, a skeleton, and sinister hooded figures were deemed too explicit for junior high students by some. The principal decided to resolve the controversy by subjecting the mural to a vote of the students. One hundred students were picked at random to view the sketch and then vote whether or not they favored the mural. The vote tally was 98 to 2 in favor and so the project moved forward. ....After three weeks of work, the "Peace or War" mural was complete. At 5.5 by 13 feet in size, it was smaller than the enormous library mural at the school, and differed in that it was portable. Local press coverage of the powerful mural led to requests for public display outside the school, and so the mural went on display in the city of San Jose and numerous other locations around the Bay area over the next four years. In 1939, it was selected to hang in the Women's Peace Projects Building at the Golden Gate International Exposition on Treasure Island. It was there that Mayor Gaines of Berkeley, upon viewing the mural, called it "The Choice", and the name stuck from that point forward. 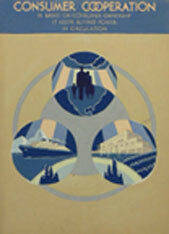 The national Cooperative League distributed a pamphlet depicting the mural at both GGIE and the New York Worlds Fair. Ray gave a copy of the pamphlet to Upton Sinclair who was then running for governor of California, and was told that Sinclair kept it over his writing desk until his death. The school eventually decided that since the mural seemed to be resonating with the larger community and hence went on loan much of the time, they offered to return it to Ray's possession in exchange for 3 large landscape paintings. This transaction was made in the early 1940s and "The Choice" remained in the artist's possession until his death in July of 2006. ....Ray Strong painted "The Choice" at the home of his father-in-law, H.C. Brown, a philosophy professor at Stanford. The left portion of the mural was the artis's vision of a world in which people lived together in cooperation and peace. At the time the mural was painted, the artist had become the education director of the Cooperative League's Northern California Council and a small Cooperative League emblem (of two stylized pine trees in a circle) was painted onto the globe on the left side, now slightly painted over. 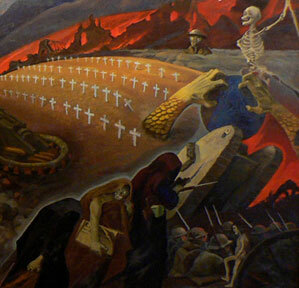 Ray painted his own likeness in the mural and is seen as the blonde man in the extreme upper left corner who is a counterpoint to the scythe-wielding skeleton who orchestrates the death and destruction wrought by war seen on the right side. 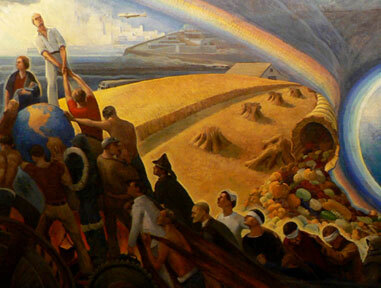 Light illuminates the large, central globe on the "peace" side of the mural, while the "war" side remains mostly in shadow and darkness. As some of the wounded soldiers in the lower center move into the "peace' side they, are assisted assisted at first by each other and then by a nurse. The artist's vision of the world is one where cooperation spurs economic progress in all areas of human endeavor inlcuding manufacturing, farming, transportation. Workers and other service professionals become integral to the realization of technological advances as represented by the futuristic city seen in the upper left. ....On the right side of the mural, the "war" side, images were derived from World War I, which at the time was considered to be the "war to end all wars." In the lower right corner, soldiers bear the helmets of many nationalities. There is no bright city of the future hear, but rather endless ruins and conflagration. An emaciated naked child rests on a wheel representing starvation, and perhaps further, an unconscious harbinger of scenes to come with the discovery of concentration camps toward the close of World War II nearly ten years hence. Huge clawed hands dig into the globe on the right; forearms covered in scales of gold coins represent the paralyzation of the world by concentrated wealth. A procession of three hooded figures in the lower right represents fear, propaganda, and munitions manufacturing. Somewhat subtly stated, a tug-of-war between these three and a group of figures on the other side further defines the ongoing tension between the two sides of the central question and that the actual choice between the two sides rests with the unified efforts of all people to move the world toward peace. Ray's younger brother, Winston, modeled the three hooded figures and a number of others in the mural. A field of skulls provides a grim contrast to the overflowing cornucopia of food on the left. Other vignettes are more or less self-explanatory. ....Though this important mural was created over 70 years ago, its lessons and themes remain just as contemporary and vital in today's world. While the long and productive career of the artist was focused primarily on his interpretation of the natural beauty of the world, "The Choice" is a revelation of one man's ability to powerfully assert his concerns and fears for the world in which he lived. More importantly, he offers resolution based on his heartfelt, optimistic belief in the basic ability of people to work together toward a common goal for the betterment of all. ....In his later years, Ray began to envision leaving an artistic legacy to his home state. This idea was originally inspired by a visit to a permanent display of small landscape oil sketches of Algonquin Park in Ontario, Canada done by legenday Canadian artist Tom Thomson in the early 20th century. 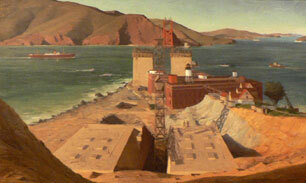 During the 1920s, Ray had completed numerous oil paintings, on location and from a variety of viewpoints of Mt. Hood and other mountains in the Cascade Range from high altitude, which he visualized as a collection to give to an Oregon school or museum for a permanent display. Over the last 20 years of his life, he contacted a number of institutions hoping to get the paintings placed in a setting similar to the Thomson exhibit in Canada. In my two and a half years of interviewing him, from 2004 to 2006, Ray often inquired about the feasiblity of this idea. I told him that in my opinion it would be difficult to get an institution in Oregon to dedicate a permanent display of these works. Instead, I suggested that he might consider making a gift of "The Choice" to a suitable institution in Oregon. Ray pondered this idea for a moment and then a wide smile arose on his face, and lifting an index finger upward he exclaimed, "That would be number one!" This endorsement set in motion a plan to offer the mural as a gift and artistic legacy to Oregon. ....Ray Strong died on July 3, 2006. I visited him a week before his death to reiterate my dedication to finding a suitable placement for "The Choice." In collaboration with Ray's heirs, who hope to honor his wishes, I have arranged for this powerful work to be exhibited in my gallery until an appropriate home can be found. Essentially, it was Ray's hope that the mural be permanently displayed in a building that has free public access to see the mural. Hopefully, the future site for the mural will be located in one of Oregon's larger population centers, but regardless, any location that offers stewardship and ongoing display of the mural as well as free access to view it will be considered. ....If you have an idea for a suitable location for "The Choice," I would be happy to discuss it with you. Until it is placed, the mural will be available for public viewing during regular gallery hours or by appointment.